Beautifully located on Gweebarra bay, the course is playable all the year round. Narin and Portnoo requires skill and proficiency with every club in the bag to overcome the subtle challenges of its relatively short but stiff links course. 12 months have passed and the Dunkineeley Invitational returned to Narin and Portnoo GC. The course was again immaculate and the new holes have further improved the layout.Golfing there was a pleasure. Well done to Micky Hughes (4,cat 1) who retained the trophy. The allegations will be contested vigorously by the defendent who outplayed the other competitors and grabbed the cup. Well done Micky, you were awesome.And well done to the greenstaff at Portnoo GC; you maintain a beautiful course to a very high standard. Once again, well done Micky. Conditions were sympathetic to the golfers but the course still had teeth to bare. Basically, you follow a loop. Out towards the ocean which you meet at hole 6.The wind was behind until then. However, once you turn you know about it! Portnoo is always in lovely condition and everyone will enjoy the course and hospitality. Dont let the length of this course fool you. It may be short but its unbelieveably difficul to score well. The course has magnificent views and some great holes - its as good as any in Donegal. Looking forward to bringing the lads down to the lynx. I used to play the course as a child, but I bet its changed a little. Its the only course that had cows grazing the fairways! Times have moved on at narin and portnoo, the secretary is Tom Plunket and the telephone no is.0749545107. for people outside of Ireland add 00353 and drop the first 0 of number. 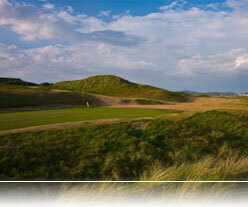 A beautiful course, if in donegal dont miss playing Narin and Portnoo. What a beauty, and what a test of golf. I played Narin and Portnoo on a recent visit to donegal and I can honestly say its one of the best links courses in Ireland. THE STAFF WERE EXCELENT. Mr. Murphy went out of his way to help. Green fees are only 30euro. So if you are planning a visit to Donegal put Narin and Portnoo on your places to visit. phone no is. 0749545107 ask for Sean or the lovely Noleen. played the links at narin and portnoo recently and for someone who played the likes of the K club and Ballybunnion. I must say that nairn and portnoo is as good as i have played. a hidden gem on the atlantic coast. a must for all golfers. Played here June 2003, we actually didn't plan on playing here but at the end of our holiday we've played this course three times. Although it is not a well known course,and it might look as being short when you look at the par and de S.S. It is actually the most beautiful links course I have ever played, the scenery is absolutely out of this world. We have also played all great courses in the North (Donegal, Ballyliffin, Enniscrone, Bundoran) But none can of these course are so enjoyable to play as Narin Portnoo. So if you have the oppertunity, go here and play, I ensure you you want to play it again and again.